Some 5,000 exhibitors from 120 countries are showcasing their products and services at the Gulfood 2017, the 22nd edition of the world-leading food and beverage exhibition, which opened in Dubai today. 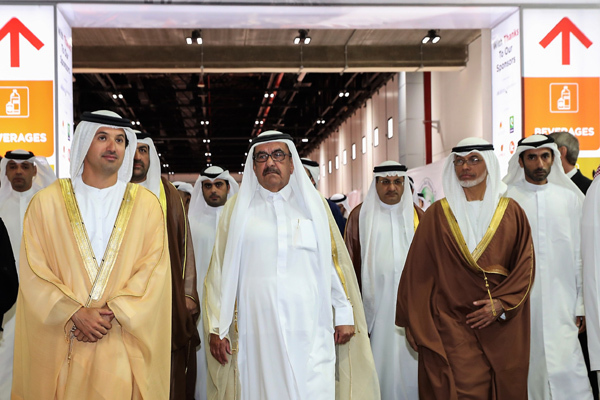 His Highness Sheikh Hamdan Bin Rashid Al Maktoum, Deputy Ruler of Dubai and UAE Minister of Finance, opened the exhibition at the Dubai World Trade Centre (DWTC) (photo). Touring the 1,000,000 sq ft show, which runs for five days and is expected to receive up to 90,000 food professionals from 150 countries, Sheikh Hamdan received a snapshot of the global innovation now impacting an industry striving to meet seismic shifts in consumer dietary preferences. “Buyer demand for healthy and halal products, as well as trusted resource provenance, has turned Gulfood 2017 into a window to global food sector reinvention. The show is already underlining its international reputation as a hotbed for unique business opportunities,” said Trixie LohMirmand, senior vice president, exhibitions & events management, DWTC. From the latest in health, wellness and free-from to ‘on-the-go’, artisan and affordable-convenience, the show lifts the curtain on a vast range of new concepts and products which are evolving the global F&B scene. More than 2,000 participants will be marking their debut at the world-renowned exhibition, which also hosts the world’s biggest annual Halal food sourcing trade show-in-show in Halal World Food. “Now in its 22nd edition, Gulfood has long since completed its evolution from a regional event with international participation to an international show that is held in the region,” said LohMirmand. The geographic influence of Gulfood is demonstrated via 120 national pavilions with four countries – Azerbaijan, Finland, Malta and Somalia – represented for the first time. China, India, Italy, Spain and the USA will mount the largest international pavilions, with Egypt, Jordan, Iran, Lebanon and Morocco showcasing regional capabilities. Visitors to Gulfood 2017 will find a highly focussed new layout designed to ensure they can make the most productive use of their time at the show by heading straight to their segments of interest. Eight individual food commodity trading markets have been created covering Beverages; Dairy; Fats & Oils; Health, Wellness & Free-From; Pulses, Grains & Cereals; Meat & Poultry; Power Brands and World Food. Back for the fourth year in a row, Halal World Food boasts more than 1,000 international specialist Halal food brands and companies. The show also hosts the annual Emirates Culinary Guild International Salon Culinaire – the world’s largest single-entry chefs’ competition. The 2017 Salon Culinaire will see more than 1,000 of the region’s top professional chefs, pastry chefs, cooks and bakers compete for honours accredited by an expert panel mandated by the World Association of Chefs Societies. Meanwhile, in a ceremony tonight (February 26) at the Conrad hotel, the winners of the eighth Gulfood Innovation Awards will be recognised for best-in-class excellence and innovation across the region’s food and drink industry.